This picture summarises what most hope to experience when they take up golf. The joy of making the perfect stroke, in a beautiful place with a good friend. Life cannot get much better than that. For most, these dreams die on the local Muni. The reality is a feeling of hopelessness as they take their 15th stroke on a par 5. Most people who take up golf give up, either due to injury, the length of time a round takes, or playing a humiliating number of strokes on too many holes. A major reason for this is that the rules of golf are made for highly skilled players, not for beginners. At the Golf Mentor, we strongly believe that beginners need to play by an adapted set of rules, called the SnappyGolf rules. The official rules of golf are guided by a dour fairness. The SnappyGolf rules are guided by the sense that people should enjoy golf. The idea is to modify the rules that cause long delays in play or horror holes for beginners. You cannot use these rules if you are playing in official competition, but you can use them if you are playing with your friends, and that is what most beginners are doing. So here they are. Enjoyment: You are playing golf for enjoyment, never forget this. Practice Swing: No more than one practice swing. Ready Golf: Play when you are ready and it is safe to hit. Bunker: If you land in a bunker, drop the ball at the nearest point that is no closer to the hole, but not in a bunker and has a clear run to the green. Take a one stroke penalty. Water Hazard: If you hit a ball into a water hazard, you may take a two stroke penalty, and place the ball on the side closer to the hole, within two club lengths of the hazard. Out of Bounds: If you hit a ball out of bounds, you may drop a ball within two club lengths of the where the ball went out of bounds, with a one stroke penalty. Lost Ball: If you hit a ball and you lose it , then drop a ball within two club lengths of where it was last seen or entered the rough. You should only spend 90 seconds looking for the ball before declaring it lost. If you want to comment or make suggestions about these rules, please go to here. Enjoyment: Most of us will never become professional golfers. 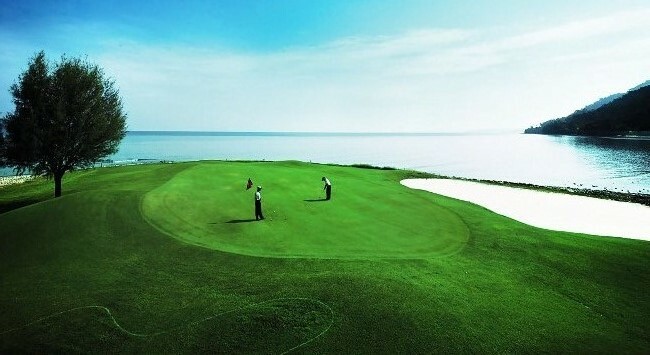 The main reason that we are playing golf is to enjoy it. It to easy to angry with yourself for playing poorly or to be overcompetive. Always keep in mind the reason you are out there. It is not impress other people or to play like a professional. You are there to enjoy golf. Courtesy: If you are courteous to other players then they will be much more likely to be courteous to you, so increasing everyones enjoyment. Practice Swing: The sad truth is that for most beginners, a practice swing is a waste of time and may even make you play poorly. So if you must take a practice swing, just take one. Ready Golf: If you are on the tee ready to go, and the player with the honor is fumbling in their bag, just hit off. After the tee shot, if you can safely hit the ball and are the first player ready to play, then... hit it. Just keep things moving. Ten Over: Did you know according to the USGA rules, if you have a high handicap, then you should not enter more than 10 strokes on any hole. Accordingly, if you are a struggling beginner, then you should pick up when you get to ten strokes on a hole. This makes golf more enoyable for you, and will be appreciated by your partners and all the players behind you. According to the USGA, the maximum number of stroke varies according you your handicap. If you join The Golf Mentor you are given a handicap and so can lower the maximum number of strokes as you improve. Bunker: Bunkers are a nightmare of the beginner golfer. The problem is that hitting out of the bunker requires special skills and lots of practice. Many beginners do not have the time and the opportunity to develop bunker skills. It is a waste of time for these players to be trying to hit out of a bunker. The SnappyGolf™ bunker rule, can be altered to allow you to get some practice at this difficult shot. For example, you can have two attempts and then drop out of the bunker if you are still in it. In this case, you would add three strokes to your score, two for the bunkers shots and one for the drop. Water Hazard: Water hazards can become a huge problem for many golfers. This rule allows an honorable way across the hazard, and what is more it can save you lots of money. Out of Bounds: The out of bounds rule is harsh, even for a strong player. The SnappyGolf™ rule keeps the play moving and saves on lost balls. Out of bound regions are often marked for safety reasons, e.g. to make players more careful about hitting into neighbours yards. Accordingly, if you use this rule, you should take extra care to avoid going out of bounds in the first place. You can do this by using a shorter club, or aiming towards the other side of the fairway. Lost Ball: It is bad enough to lose a ball, without having to go back to the place you hit the ball from. This rule can save a great deal of time. If you are using this rule, you should also only spend 90 seconds looking for the ball, otherwise much of the benefit of the rule is lost. If you are beginning, pay with cheap golf balls that you can afford to lose without worrying about it. Frankly, if you are just beginning, an expensive ball is unlikely to make much difference to your game.